MEMBERS OF THE Irish Defence Forces had a busy year, with personnel supporting State agencies at home and 1,690 deployed abroad for peacekeeping missions. At home, personnel were deployed on a range of aid to civil power and aid to civil authority operations. The Defence Forces also deployed approximately 3,364 personnel in support of State visits and the Papal visit in August 2018. The Naval Service conducted 740 boarding operations and detained seven vessels for alleged infringement of fishing regulations. And the Air Corps completed more than 310 emergency air support service missions with the HSE. Internationally 1,692 personnel served in overseas United Nations mandated peace support and security operations in 14 countries and one sea. There are currently 650 members of the Defence Forces serving in these countries. The largest Defence Forces deployment is to South Lebanon with UNIFIL where 462 personnel are deployed, to create a safe and secure environment; Ireland took over a full Battalion in November 2018 which saw an increase in personnel deployed there by over 100. Ireland has 138 personnel deployed as a Disengagement Observer Force in the Golan Heights, UNDOF, where in Oct 2018 they completed a relocation from the Golan Heights to Syria. The Irish Defence Forces have the longest unbroken record of overseas service with the UN of any country in the world since first deploying to a mission in 1958. Email “Bomb disposal, prison security, peacekeeping - The work of the Irish Defence Forces in 2018”. 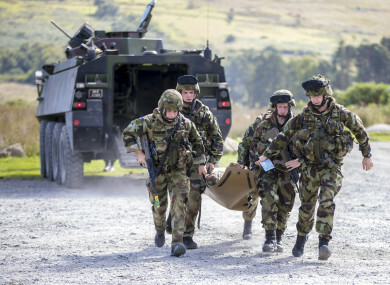 Feedback on “Bomb disposal, prison security, peacekeeping - The work of the Irish Defence Forces in 2018”.